If you are planning to share copies of this Ebook with students in your classroom, please also purchase the NH120E Classroom License. 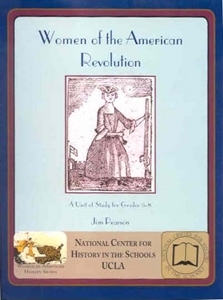 Students explore the varied roles of women in the Revolutionary movement. From a variety of contemporary accounts, they discover that the struggle for American independence drew upon extensive support of and participation by women. Students analyze documents including a 1768 poem, "Patriotic Poesy;" a 1770 Broadside; the 1775 cartoon "A Society of Patriotic Ladies;" letters giving different perceptions on an incident in which women attacked a coffee merchant accused of profiteering; the Abigail and John Adams correspondence regarding women’s enfranchisement; and a short excerpt from Judith Sargent Murray’s The Gleaner. Each of the lessons includes suggestions for activities to further the study of the active role of women in the events that led to the Revolution and the ways in which women participated in the war.